Home » Entertainment » Diane Sawyer Personal Life: Husband’s Tragic Death To Children Details! Diane was living a balanced work-personal life when suddenly something terrible happened that shook the foundations of her happiness. But what was the tragedy that had befallen upon this 72-year old journalist? Continue reading this article to find that out! Diane was in the process of recovering from the demise of her mother, Jean W. Sawyer, who had passed away at the age of 94 in October 2014, when another misfortune struck her. Her marriage to actor and an Oscar-winning director Mike Nichols came to an end, but it was not the voluntary separation of the couple that ended the 26 years long partnership. It was the ultimate fate that every mortal being has to go through death. On the 19th of November, just after a month of Jean's death, Mike suffered a fatal heart attack at the age of 83 that took his life. Mike's funeral was held at a Frank Campbell home. Diane and Mike first met at the airport in Paris when they were both returning to the US. Diane was 40 at the time while Mike was 54. Reportedly, Diane was hiding at the airport lounge as she had not made her hair when suddenly Mike came in front of her and said that Diane was his hero. But, Diane complimented him back saying Mike was her hero and even asked him out for lunch. Mike had previously revealed that Diane wanted to interview him for 60 minutes to which Mike accepted, and it resulted in the couple having about 14 lunches together. Mike and Diane later got married on 29 April 1988. Mike was the first husband of Diane although Diane wasn't his first wife. Mike was previously married three times to Patricia Scott, Margo Callas, and Annabel Davis-Goff. But they didn't last very long all of them resulted in divorce. Though Diane hadn't tied the knot before Mike, she had two boyfriends in the past namely Congressman Bill Bradley and actor Warren Beatty. Even though Diane and Mike had no child together, Mike had three children from his past marriages whom Diane adored, especially her step-son Max, whom she was also spotted holding hands while walking to Mike's funeral. After living some time in isolation, Diane was finally spotted out in public with her ex-boyfriend Bill Bradley in 2016. The two had a lovely dinner at night at Molos, in Weehawken, New Jersey and seemed to be comfortable in each other company. But, as of now, no update has been disclosed on their status. So, it won't be a trouble to assume their meeting as an ordinary get together between two good pals. The former World News Tonight host has chosen work as an escape to her previous tragedies. She is a workaholic and loves her news 24/7 as she has written in her twitter bio. Does this busy woman even have friends to accompany her? Well, the answer is, Yes. Diane is good at being friends either within her work circle or out of it. On 3 May 2018, she posted a photo of her with two besties, Carol and Julie, in her official Instagram account. The trio looked gorgeous in the picture. Many fans loaded the comments section with blissful comments. The senior lady might have felt too old to spice up her love life after going through a treacherous tragedy in the previous years. Hence, she is exchanging love with her lady loves. 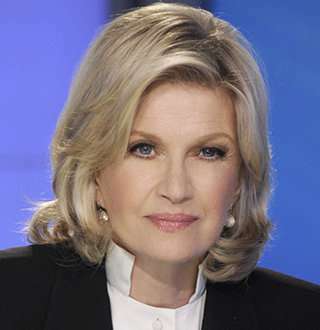 Diane Sawyer was born on 22, December 1945, in Glasgow, Kentucky to parents Jean W. Sawyer and Erbon Powers "Tom" Sawyer. Her family moved to Louisville soon after her birth. Sawyer attended Seneca High School and received a Bachelor of Arts degree with a major in English from Wellesley College in Wellesley, Massachusetts. Her career in TV started when she joined as a weather forecaster for WLKY-TV in Louisville. Diane joined the CBS News as a general assignment reporter in 1978. Diane became the first female correspondent to host 60 Minutes in 1984. She also co-anchored the ABC News' Primetime Live with Sam Donaldson in 1989.